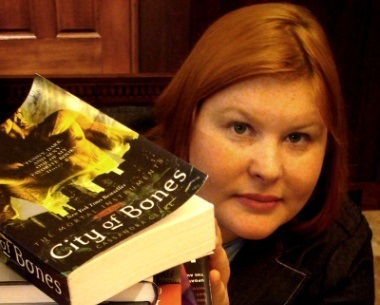 Judith Rumelt (born July 27, 1973), better known by her pen name Cassandra Clare, is an American author of young adult fiction, most known for her New York Times bestselling series The Mortal Instruments. The first installment of The Mortal Instruments, City of Bones, is scheduled to hit theaters in August 2013. Following in the blockbuster footsteps of Twilight and The Hunger Games, City of Bones is said to be on its way to becoming the next big teen-book-turned-movie sensation. In this exercise, you will watch Cassandra’s interview with Holly Black in which they talk about the themes, the characters and the readers of The Mortal Instruments. Before watching the video, familiarize yourself with the following entries. I. Complete the following sentences using the words in the box. Use the correct grammatical form of the words. II. Some of the words above look or sound a lot like other words which actually have very different meanings/usages. These words can be easily confused and are often misused. To strengthen your knowledge of these confusing words, complete each sentence below with one of the words provided in pairs/ trios. Consult a dictionary when necessary.